COLUMBIA, Mo. (AP) Dazon Ingram scored 18 points – including 15 in the second half – and grabbed nine rebounds to help Alabama overcome dismal first-half shooting and defeat Missouri 57-54 Wednesday. Riley Norris, Braxton Key and Jimmie Taylor each added nine points, combing for 19 second-half points. Bola Olanyian scored just two points but grabbed a game-high 14 rebounds as Alabama outrebounded Missouri 39-36, including 21-13 in the second half. The Crimson Tide have now outrebounded their opponents in 20 of 25 games. Alabama (15-10 , 8-5 Southeastern Conference) had its worst offensive half of the season, making just 5 of 27 (18.5 percent) field-goal attempts before the break. After a jumper by Key opened the scoring just 16 seconds in, the Tide missed 18 of their next 19 shots over the following 15 minutes. Ingram said his mindset didn’t change following the first-half slump. Alabama missed its first five second-half shots. But, after a 3-pointer by Jordan Geist gave Missouri an eight-point lead with 7:52 to play, the Tigers made just one if its last eight shots while Alabama hit 7 of 9 down the stretch. K.J. Walton had nine of his 12 points in the first half and Kevin Puryear finished with 11 for Missouri. Jordan Geist added nine points while Jordan Barnett, who came in averaging a team-high 13.1 points per game, scored just five on 2-for-10 shooting, but grabbed 12 rebounds. Alabama made seven of its final nine shots while Missouri shot 2-for-10 over the final eight minutes. 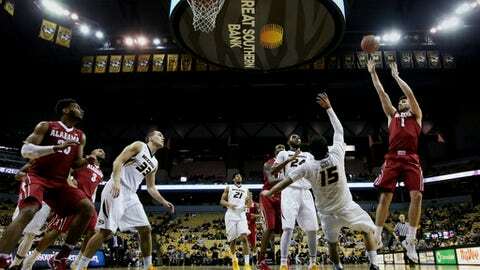 After a turnover by Terrence Phillips in the final minute, Missouri was forced to foul trailing by one possession. With seven seconds remaining, Key missed the front end of a one-and-one, but Donta Hall secured the offensive rebound, sending Ingram to the line. Ingram sank both free-throws, sealing the Crimson Tides’ fifth conference road victory of the season. Hall finished with four points and six rebounds. Alabama: The Crimson Tide have now won five consecutive games against Missouri, including a 68-56 victory Jan. 18 in Tuscaloosa. This was Alabama’s visit to Mizzou Arena since Jan. 18, 2014, a 68-47 loss. Missouri: The Tigers were seeking their third-consecutive conference win at home, something they have not accomplished since the 2013-14 season. Missouri won its first conference game of the season on Feb. 4, 83-78 against Arkansas, before defeating Vanderbilt 72-52 Saturday. With just under five minutes remaining, the ball appeared to go out of bounds off Ingram, but was ruled last touched by Missouri, inciting boos from the home crowd. Following that call, Alabama hit back-to-back 3-pointers on the ensuing possessions and never surrendered the lead. Alabama: Hosts LSU Saturday. The Crimson Tide defeated LSU 81-66 Jan. 4 in Baton Rouge. Missouri: Visits Tennessee Saturday. The Tigers won the last meeting 75-64 on Feb. 13, 2016 in Columbia.